This is a two part series, with both stories involving the heroes/heroine bawling down the street. The first story is about me. I believe that I was in kindergarten or first grade. I had a little friend up the street and around the corner who invited me over to her house to play. This friend also had a twin brother, and when I got there, I saw that he had also invited a friend over to play. Everything was pleasant enough, we were all out in the backyard. The boys were doing their thing; we were doing ours. I'm sure the mother was thinking that she had this play date thing totally under control ... when the boys had the brilliant idea to kiss me. The problem was: I DID NOT want to be kissed. And they didn't care. I bolted like a horse, and they followed me. I was a pretty good runner, but there was two of them, and eventually they cornered me behind the swing set, where they both planted a kiss on my face. In my mind, it was the worst thing that had ever happened to me, and I started to cry. The heavy, racking crying where you can't see anything, and can barely keep your balance. I had to get out of there. Hardly knowing what I was doing, I ran through the house, past the twins' mother and all the way home -- wailing the entire way. My Mom received a phone call. The twins' mother was dreadfully sorry. She'd talked to the boys, and they were sorry too. They would never do it again. She hoped that I would come over again sometime to play. 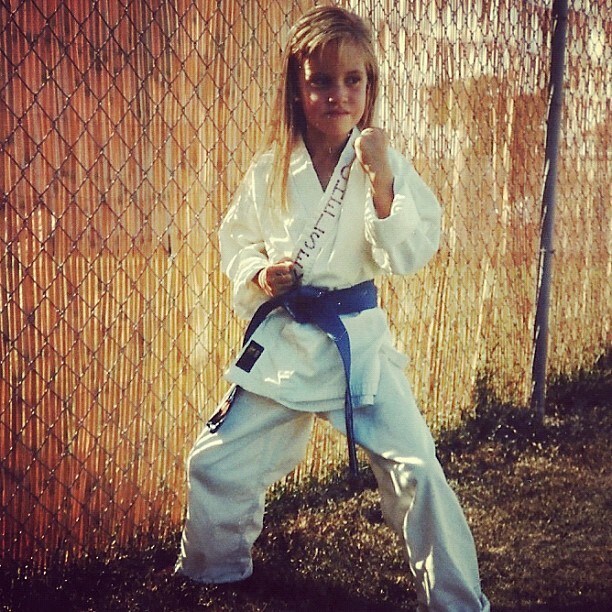 When my Dad got home, he wanted to know why I hadn't used my karate. I didn't know, but I'm guessing it had something to do with the fact, that the only other thing that made me cry harder than boys wanting a kiss was sparring. After reading this story it may or may not surprise you to hear that I absolutely HATED kissing tag! Am I the only person on the face of the earth who hated that game?? Anyone else remember being traumatized by things that just aren't that big of a deal?